The TBS-100 FCXL Random Height case sealer is a solid performer and eliminates costly downtime associated with changing over case sizes. Built with heavy duty tubular steel, this case sealer is built tough for years of top performance. Multiple lines of packed cases can feed into this one packaging machine - the cases can be of varying heights but similar case width. This top and bottom case sealer is ideal for egg producers in the food industry who fill RSC cases with cartons of eggs in varying pack counts. For your safety this random height case sealer is full guarded with hinged doors and standard safety interlocks. TBS-100FC XL Top and Bottom Case Sealer with high speed belt drive and high speed tape heads at 20 cpm. The egg carton packaging equipment was modified for 4 case sizes, randomly fed into case sealer machine, with case height and automatic case length sensing. Case infeed metering gate accepts cases feeding into sealer machine back to back and feeds them one-at-a-time into the case sealer. Photo eyes sense case height and an Allen Bradley PLC with servo driven height adjustment sets the tape head height. Also included are automatic case length sensors (for flap kicker). All cases are 12" wide. The dual spring loaded side belt drives transfer the cases over the 3M Accuglide tapeheads providing square cases every time. The spring loaded belts allow for small variances in the case width. 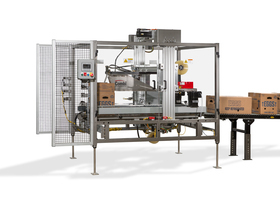 Fully guarded egg packaging equipment with hinged access doors include electrical interlocks that disconnect power and air for operator safety. Live roller case infeed conveyor at 65 fpm.